When I first came out to Grace Haven Baptist in Youngsville, North Carolina on a warm September morning, I knew my challenge would be seeing where the light would be a little more than a month later and in the afternoon. I was immediately drawn to this stone bridge and knew this would be a great location for a wedding day portrait of the couple. I had spent the earlier hours at Lions Gate Inn in Wake Forest, where the bride and her bridesmaids were getting ready. It was a real pleasure to meet each of them and spend time learning about their friendship. While the hair and make up portion took quite some time, the ladies also had to paint a welcome sign and take a moment to have a drink or two. They shared some special moments between them and individually. The grounds at Lions Gate were far too beautiful to pass up so I chose to do bridals and bride and bridesmaids images there on the grounds and in the foyer of the Inn, by the bride's request. We even snuck out in the street for a couple images! On the day of the wedding, bright, clear skies dominated the day. The 5:00 wedding started a little later than anticipated, so by the time we got to our couple portraits, my daylight was fading fast. I was doing bridal images when this picture came to mind, so I asked my groom to step in and asked my bride to walk in her current direction to him. I did not want her to turn around and face the camera, as this would have caused her gorgeous wedding dress to get wrapped around her feet and would lose the view of the back of her dress. So I angled her slightly and had her turn her only her face towards me. A little off camera flash to the couple's left and we had this image. If you are looking for a great location in the Raleigh area to have a outdoor fall wedding, Grace Haven Baptist Church in Youngsville, just outside of Wake Forest, is a wonderful choice. Their semi-remote 72 acre location provides a quiet and serene environment in which to have a private wedding ceremony. 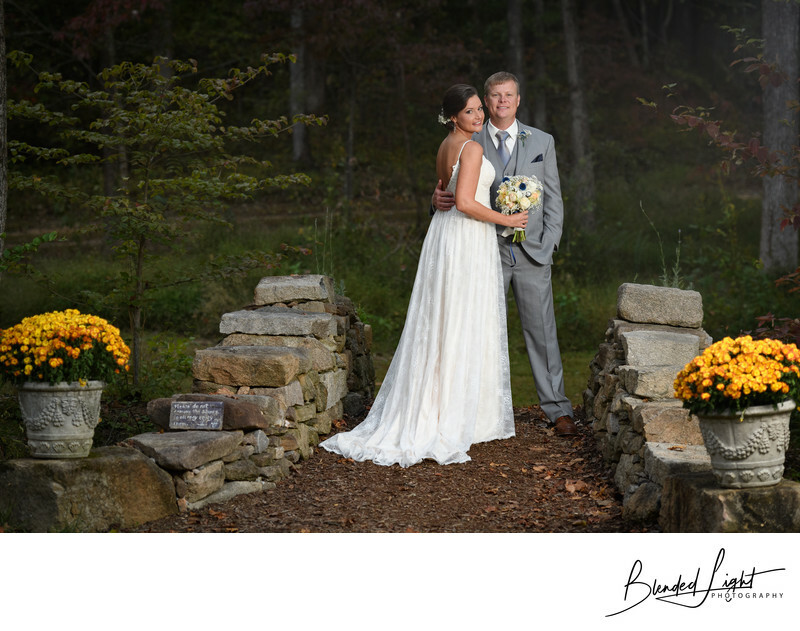 The grounds are well taken care of, backdropped with beautiful fall colors, roses and some of the best stone work in the area. They provide a 2400 square foot covered eating area, which is completely stone and garnished with a large and functional wood burning fire place as well as a separate location for your caterers to work in preparing the meals. For the more adventurous couples, and weather permitting, the venue also has a fire pit. A mid to late afternoon wedding will truly shine as the sunlight hits the leaves on the treed backdrop of the ceremony area. Nothing more you can ask than a beautiful couple getting married in a gorgeous setting! As wedding photographer, and hopefully your's, you'll receive the same top notch effort towards providing you with a gorgeous gallery of images to commemorate the day you and your husband said "I do"! 1/160; f/3.5; ISO 800; 110.0 mm.